Susanna Horenbout’s chance meeting with a jeweler from Antwerp pulls her and her betrothed, courtier John Parker, into a deadly plot against the King. Ever since Henry VIII’s sister Mary gave him the spectacular Mirror of Naples, part of the French Crown Jewels, the King of France has been plotting to get it back. After the French king is captured in battle, the secret deal struck for the jewel’s return is in jeopardy—and French agents in London are taking matters into their own hands. But the powerful Duke of Norfolk has caught wind of the secret deal and sees the planned theft as an opportunity to rid himself of a hated rival at court—even if it means plunging England into an unwinnable war with France. As Susanna and John Parker desperately search for the jewel, trying to stay one step ahead of the French, they're swept into a power struggle with men who will crush any obstacle to get what they want. And with the fate of Henry's kingship in the balance, they must figure out who Henry's true enemies are—before it's too late. This sounds like a wonderful read!!! Sounds great and gah -- I adore the cover! What a beautiful cover! Definitely keeping this one on my list for must have upcoming releases. I love French and English history and this sounds very good with a combination of both. The power struggle between those two countries during that time period was fraught with danger, intrigue and power playing. I agree with the other commenters about the cover of the book. It is just lovely. The "lacy K" is so pretty! I can't wait to read this novel. Thanks for sharing! 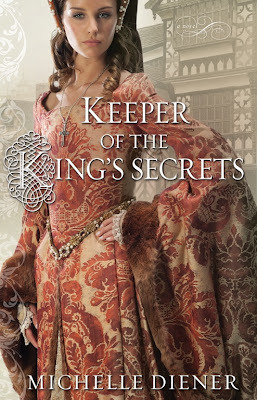 KEEPER OF THE KING'S SECRETS looks like a beautiful read.